Who, What, Why: What do Tube drivers do and how much do they earn? The entire London Underground network is out of action as drivers strike over pay and conditions related to the planned introduction of all-night services. But what do drivers do and how much do they earn, asks Justin Parkinson. A driver's starting salary - which follows about six months of training - is £49,673, according to Transport for London (TfL), which adds that this "doesn't alter depending on length of time in role". They typically work a 36-hour week and get 43 days of leave every year, including bank holidays. Six of the days off are compensation for working 36, rather than 35, hours a week throughout the year. Shifts begin as early as 04:45 and end as late as 01:30, says Finn Brennan, lead negotiator for Aslef, one of the unions taking part in the strike. The early shifts start with safety checks on trains, he adds. Driving duties vary. On some lines, the continued use of older trains means that drivers themselves use a lever known as the "dead man's handle" to move them between stations. More modern trains, making up the majority of stock, drive and stop themselves, relying on automatic signalling. On these, it's the driver's job to decide when to close the doors and leave stations. He or she can also override the system in case of an emergency, such as a customer falling on the track. 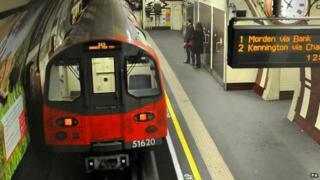 All trains are set to move to the modern system by 2020, TfL says. Drivers also monitor on-board equipment and use the train's public announcement system to inform passengers of delays and the reasons for them. "It's a responsible job," says Brennan, who worked as a driver on the Northern Line for 23 years. "Over the years stations have become busier and there's more need for trains to pass through more frequently. It can be repetitive having to check platforms before leaving stations, but it's a vital and important role." The unions argue that introducing all-night services will make the hours worked more unsociable and say the dispute is not about pay. TfL argues the recruitment of 137 extra drivers will "reduce the impact on our existing drivers". It has offered a £2,000 "transitional bonus" for the drivers affected, but the unions say that this will not result in a permanent pay increase for those having to do overnight shifts. "As promised, drivers are required to drive and/or operate trains, as rostered, in accordance with rules and procedures to the highest standards of safety and customer service," a TfL spokeswoman says. Members of the Rail, Maritime and Transport union, the Transport Salaried Staffs Association and Unite are also taking part in the strike. Trains on the Central, Jubilee, Northern, Piccadilly and Victoria are due to start running throughout Friday and Saturday nights from 12 September.